The package said "Use as intended" and nothing else. So, do not just leave it sitting on the shelf. Use it. 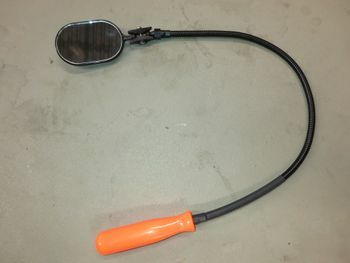 This inspection mirror was bought and improved in stiffness by Ian on February 17, 2016, after he had to fashion an improvised inspection mirror a few weeks prior, and other members had expressed desire to have one more recently. He intends to further upgrade it with LEDs to illuminate the subject being inspected and a hook for hanging it. This page was last modified on 28 February 2017, at 21:51.